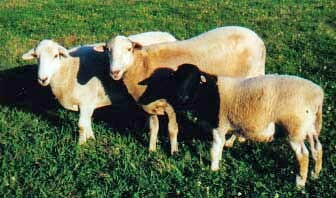 Characterised by strong and long head; broad and strong shoulder; wide and deep chest; straight legs; straight and long back-line; well developed udder; even distribution of fat in carcass; coat colour is white with black confined to head and neck; short and loose coat of hair or wool (Wilson, 1991). Found over most of southern African countries including South Africa, Namibia, Zimbabwe, Angola, and Botswana in lesser numbers. Also in Kenya and Tanzania with smaller numbers in West African countries. The breed is the second most numerous sheep breed in South Africa and accounts for 65% of the commercial flock in Namibia. The habitat is mainly semi-arid and arid, and the breed is mainly maintained in commercial ranches (Wilson, 1991). This breed was developed in the Grootfontein area of South Africa from 1942 onwards, from crosses of Dorset Horn males and Blackhead Persian females. A fixed type was developed through inter-se mating. A breed society was established in 1950 in the Republic of South Africa. The Dorsian (White variety) was affiliated to Dorper in 1964 (Wilson, 1991).